Berkeley - When Justin Christensen contemplated college, he looked forward to a small, tight-knit school. An adviser persuaded him to apply to the University of California, Berkeley, but Christensen tossed his acceptance letter aside. He thought UC Berkeley was too big and overwhelming. He didn't think it could offer support for the challenges he would face as an incoming freshman - and as a profoundly hard-of-hearing student. But his mother persuaded him to attend Cal Day, the campus's annual open house. As the Cal marching band paraded past him in the Valley Life Sciences building, the UC Berkeley school spirit he witnessed was contagious. He became equally impressed by the campus's academic prestige and its longstanding commitment to disabled students. 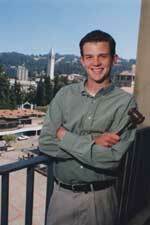 Today, Christensen, 20, is the executive vice president of the Associated Students of the University of California (ASUC), UC Berkeley's student government since 1887. Sitting in his own office in Eshleman Hall, he represents more than 30,000 students, chairs ASUC Senate meetings, and sits on the Store Operations Board, which oversees the ASUC's commercial activities. He manages a staff of 50 students and controls a personal office budget of $18,500. "Cal has transformed me," said Christensen, a junior this fall. And Christensen is transforming UC Berkeley. Not only is he considered the first disabled executive officer in the ASUC, he's also the new co-president of the Disabled Students Union. He has a grade point average above 3.6, is a two-time co-president of his residence hall, and last year worked both as an ASUC senator and a reporter covering women's soccer, gymnastics and baseball for The Daily Californian. He'll also take 16 units of classes this semester. "Justin is one of the most industrious and ambitious student leaders I've worked with in my 15 year career in student affairs," said Karen Kenney, UC Berkeley's dean of students. "He's very likeable and just exudes happiness. He's not only a role model on campus - for all students, but he's also an example of the diversity represented by our student leaders." It wasn't until Christensen was three that he was diagnosed as profoundly deaf, a condition he believes may have resulted from antibiotics administered when he was seriously ill at age six months. There are various degrees of hearing loss: mild, moderate, severe, profound and totally deaf. "I had no language," Christensen said. "I basically started developing language at age three, not from birth. I took years of speech therapy and succeeded in mainstream schools. Now I speak clearly, use hearing aids, and read lips. I fool most people into thinking I have perfect hearing." From ages 3 to 6, Christensen attended the San Francisco Hearing and Speech Center. Every summer he returns, to visit and work with the kids who are excited by a "big guy with hearing aids," he said. He also tries to reassure parents that their hearing-impaired children can look forward to rewarding, successful lives. When he told one mother that he attends UC Berkeley, she began to cry. "They're tears of joy," she told him. After graduating from private San Francisco University High School, Christensen was well prepared academically for UC Berkeley. But life at a big university did require adjustments. He realized quickly that he should sit right in the front of large lecture hall classes, to read lips. He also capitalized on discussion sessions with graduate student instructors and took advantage of professors' office hours to talk one-on-one. And because he can't read lips and write his own notes simultaneously, Christensen subscribes to note-taking services to make sure he doesn't miss anything. He also studies in groups with friends he makes in class. "I've gotten past the hard part, the Wheeler (Hall) lectures," he said about the large introductory classes. That Berkeley is the birthplace of the disability rights movement is not lost on Christensen, who spent hours and hours in The Bancroft Library reading the histories of disability rights leader Ed Roberts and others for a history class project. "It really gave me a sense of perspective on how far the disabled community has come in 30 years," he said. Christensen reached a turning point last year when he watched the film "Sound and Fury," about two deaf children whose efforts at language could not be understood by their parents. He said he is especially close to his parents, "and I'm so happy that they're proud of me." His father, Max, a sound engineer, helped Christensen with a high school presentation that used a hip hop record to show fellow students what parts of the music Christensen could - or could not - hear. His mother, Janet, returned to college and earned a teaching credential after he started at the San Francisco Hearing and Speech Center. Now, she is director of its deaf and hard-of-hearing program. Even so, watching that film was "really a big night for me," said Christensen, noting that, before then, he really hadn't focused on his hearing loss and years of hard work. "It made me think so much about where I started, and how I used to be those kids who no one understood." He began to think about the pervasiveness of sound and how his experiences have shaped his character and the way he values family and relationships: "I try not to worry about the small things," he said. UC Berkeley and plans to go to graduate school after earning degrees in social work and maybe political science. He sees himself as a school principal or administrator some day. His mother, Janet, said the most important lesson she and her husband tried to impart to their son was to set his own limits. "He hasn't found many, has he?" she said. Some of the tools Christensen uses to deal with his deafness, such as lip-reading and closely watching people's faces as they talk, likely have served him well in dealing with people, said his mother, adding, "He's extremely comfortable talking with anybody - anywhere, any time, any place." Janet Christensen said the challenges and adjustments her son faced growing up may have helped make him comfortable taking risks. Proud of his accomplishments, she isn't surprised at his level of engagement on campus. "He loves being a booster. He likes being involved," she said. "Education is very important to me," Justin Christensen said. "Just like I'm trying to figure out how to contribute to the campus, I'm trying to figure out how to make a difference." He believes that educators can affect more change by working with youngsters than can politicians or lawyers working with larger constituencies or legal issues. "I consider myself and my successes proof that nothing can stop you if you work hard enough," he said. "I have a motto: 'The ability to listen and understand is far more valuable than the ability to hear.'"